Wayne Robbins, D.O. specializes in cochlear implants to help children and adults restore their hearing. A cochlear implant consists of two separate parts. There is a small coiled wire that is surgically implanted into the hearing organ (the Cochlea), and a speech processor with a microphone which is worn on the ear much like a hearing aid. Cochlear implants are very different than hearing aids. Hearing aids amplify sounds for people with partial hearing loss. Cochlear implants process sounds, changing them into specific electric signals. These electronic “codes” are transmitted across the skin by radio waves to the implanted wire which directly stimulates the hearing nerve and allows deaf patients to perceive sound. 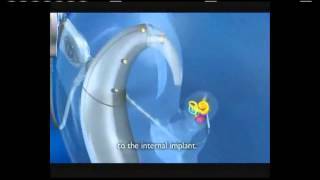 Currently Cochlear implants are approved for patients 12 months and older. Many factors affect the results of implant surgery, perhaps the most important is the duration of deafness prior to surgical implantation. Surgery typically takes two to three hours and patients recover quickly over 5 to 7 days. The device is usually activated after all the healing is complete, approximately one month after surgery. The majority of patients can expect to at least hear environmental sounds such as alarms, door bells and telephones. Some of the best results from cochlear implants have allowed completely deaf patients to hear and understand when talking on the telephone. Careful evaluation is performed prior to considering surgery to try to predict the amount of benefit a particular candidate can expect. View the video below of one of Dr. Robbins’ patients when his cochlear implant was activated. Call our office at (810) 694-0600 to make an appointment. There are many options for treating hearing loss and tinnitus. Mid Michigan’s Channel 12 interviews Dr. Robbins about advanced treatments for hearing loss. The doctors and audiologists at Ear, Nose, Throat & Plastic Surgery Associates possess the credentials needed for the most innovative and effective treatments to diagnose and treat hearing loss for patients of all ages.